Tempe Arizona is located just outside of Phoenix and there’s a ton to do here. If you’re tempted to classify Tempe as “just another suburb of Phoenix,” don’t. 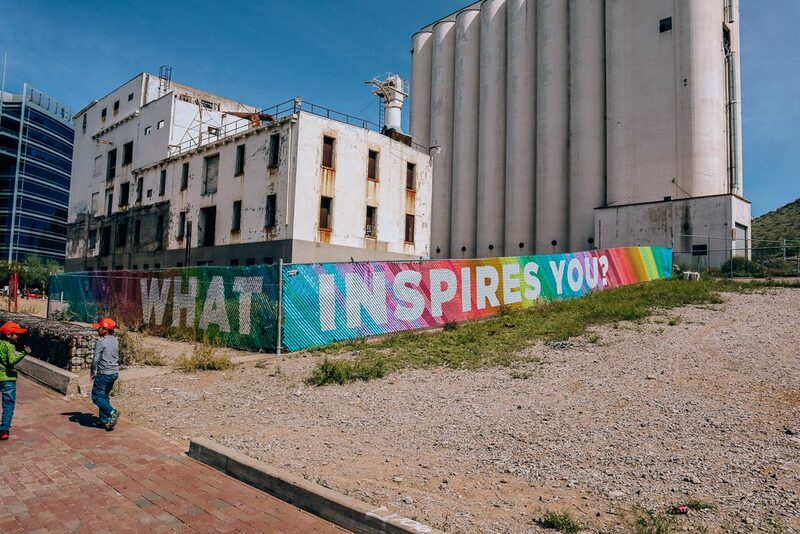 Tempe has a personality all its own and you’ll find plenty of things to do in and around the area. 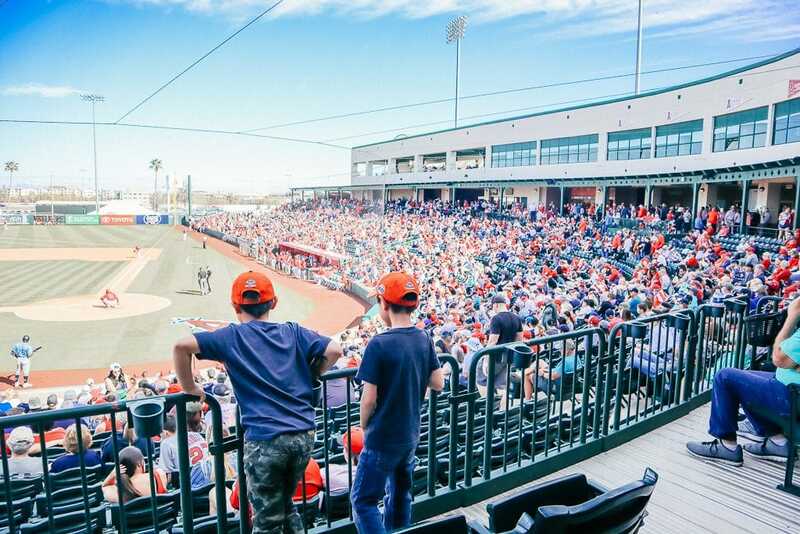 My family spent part of our spring break in beautiful Tempe – and let me tell you – March is a PERFECT time to visit. We’ve been to the area twice before, once in February and once smack in the middle of the summer and we think March is the best time to visit…although you should jump at any chance you have to explore Tempe. No matter what time of year you visit, I hope this complete guide to Tempe with kids will be a fun resource for you. This post is sponsored by Tempe Tourism. All opinions are my own. If you’re flying, you’ll arrive at Phoenix’s Sky Harbor Airport, which is a quick jump to Tempe. 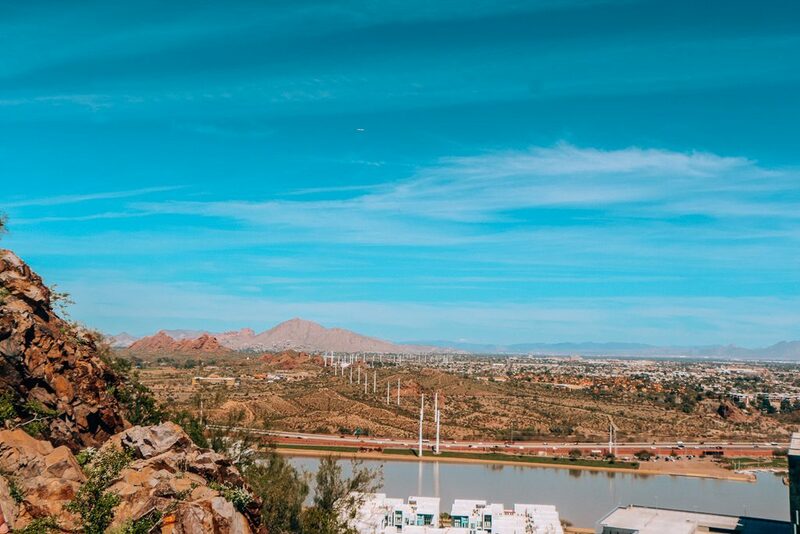 Tempe is much closer to the airport than most of the in-city Phoenix attractions you might want to check out. If you are driving, you’re going to catch 1-10 at some point. The Tempe area is very easy to navigate, although some of the Phoenix traffic spills over, making drive times a little longer than you might imagine. We stayed at the Hilton Garden Inn on South Price near the ASU Research Park, which is a dual property Hotel with Hilton Home 2 being in right there also, sharing some of the facilities. 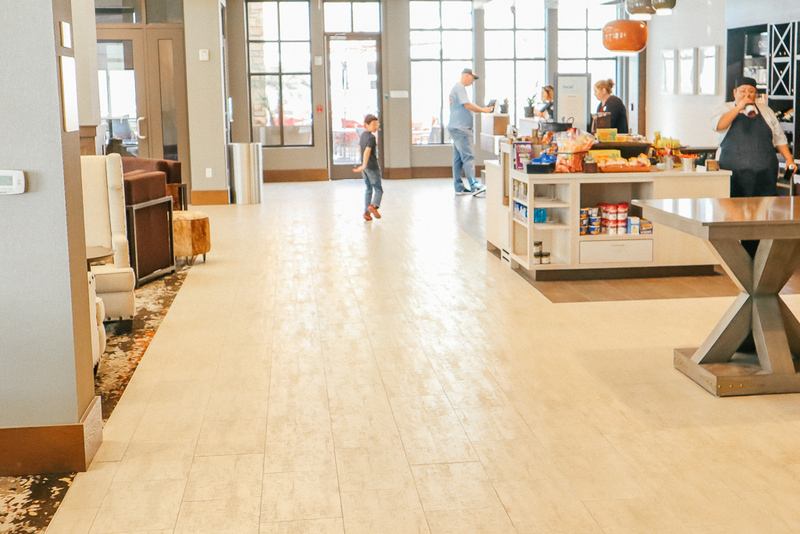 The Hilton Garden Inn has a comfortable lobby, a mini-mart area for snacks and sundries, a bar, and a meeting area. There’s also a really nice-looking outdoor area with a fully heated pool and spa and propane heaters, so you can enjoy the outdoor space year ‘round. The lobby is very spacious with a breakfast area, bar, and meeting spaces. The Hilton Garden Inn offers breakfast but it is not included in the price of your room. There’s an onsite restaurant, Tres, that serves lunch and dinner. We had zero complaints about the service or the comfort at The Hilton Garden Inn but we didn’t avail ourselves to any of the amenities. We were go-go-go our entire time in Tempe just used our room for sleeping. We had about a 5-10 minute drive to get to the downtown Tempe area, which we didn’t mind. There are places to stay in the heart of downtown, if you want to be able to walk to things, or closer to the airport. 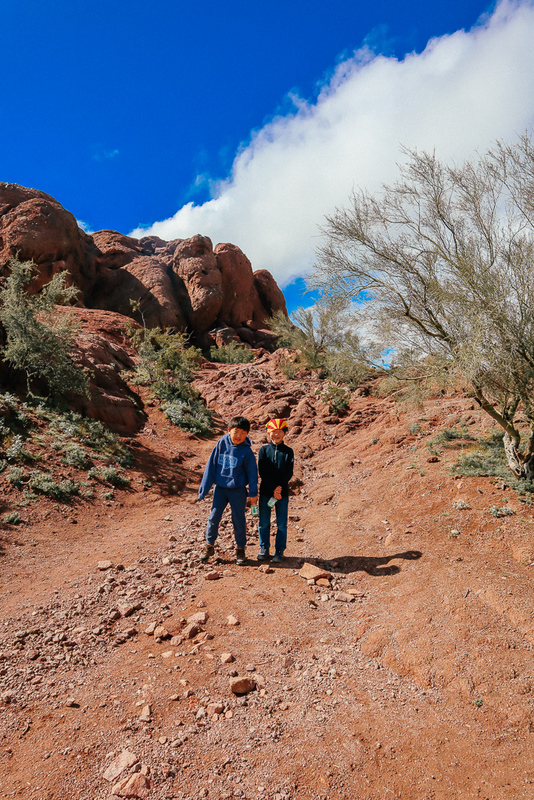 If you're traveling with kids, you might appreciate being away from the hustle and bustle of downtown. My only negative on this property was that the parking was very sparse. We had to troll for parking every night when we returned to our room. I believe the hotel was at full capacity due to spring training and although it didn't feel crowded, it was hard to find a parking space. Not a mountain, A as in the letter A Mountain. You’ll see why once you get there but my family and I had fun with the word play on this one. It’s really funny if you’re an eight or nine year old boy. Or, someone who is conditioned to laugh at eight or nine year old boy humor. This is a moderate level hike that’s just off downtown. There’s ample parking around the area and lots of hikers to visit with on your way up and down. The top offers a great view of downtown Tempe and also of the airport runway. Most of the path is paved or includes man-made steps but there are a few places that are pretty rough terrain, particularly near the top. A Mountain is also known as Hayden Butte. You will find the trail head just over the light rail tracks east of Mill Avenue at Third Street. For more check out their website. The Desert Botanical Garden is not technically inside Tempe but it’s right on the edge of Downtown Tempe and easily accessible if you’re staying or exploring this area of town. This is definitely a don’t miss and, if you can swing two visits, plan to go during the daytime and again at night to see the Electric Desert. Yep, that's a big one. 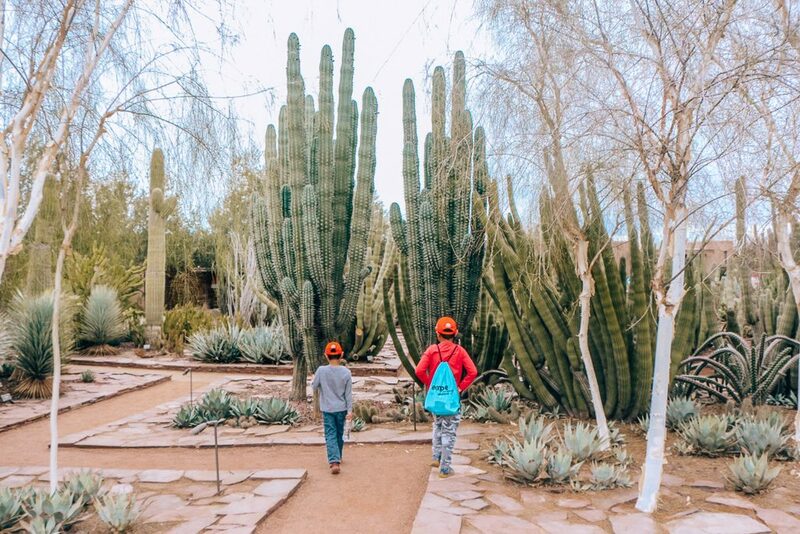 The Desert Botanical Garden is a living history museum featuring 55,000 desert plants from around the world on 55 cultivated acres. They offer an on-site restaurant, Gertrudes, that offers a seasonal, ingredient driven menu that showcases local artisans and farmers. They also have a snack bar with outdoor seating that has amazing, fresh sandwiches. There's also a really cool gift shop that has all kinds of fun, local items like soaps and clothing…as well as local Arizona souvenirs. Electric Dessert is a light and sound experience by Klip Collective. Cactus and desert become a living canvas in this nighttime experience, taking visitors on an immersive journey through the garden using light and original music. Electric Desert features seven site-specific locations, each one inspired by and related to the Garden. It will continue nightly through May 12, 2019. It is really, really, cool and you should go see it if you get the chance. The Desert Botanical Garden is open Sunday through Wednesday from 8:00 a.m. to 10:00 p.m and Thursday through Saturday 8 a.m. to 11 p.m. For more information, check out their website. My friend told me her kids call these “the poop mountains” and you can kind of see why…they do sort of resemble the poop emoji, don’t they? I know…once you see it, you can’t unsee it. The hole in the mountain is right outside the Desert Botanical Garden, so you can combine a short hike here with your visit. It’s also located very near The Phoenix Zoo, which we didn’t get to see on this trip. We have been there before and it's worth a visit, if you have time. You can actually get to this trail through the parking lot of the Phoenix Zoo. Turn left once you enter the zoo and continue until you see an additional parking lot near the butte, next to the lagoon. We went here mid-afternoon, although this is a very popular spot to watch the sun set. 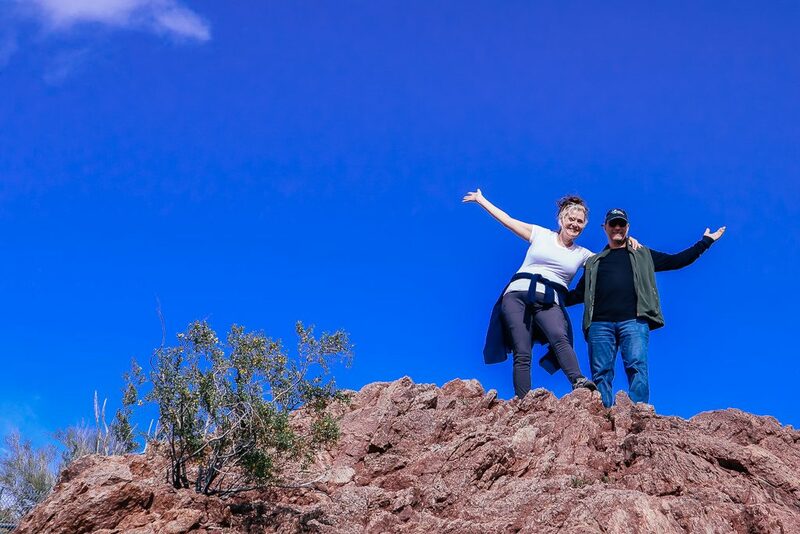 Due to weather and other activities while we were in Tempe, we weren't able to get up here for a sunset but I'm so happy we got to see it and do a little bit of exploring. 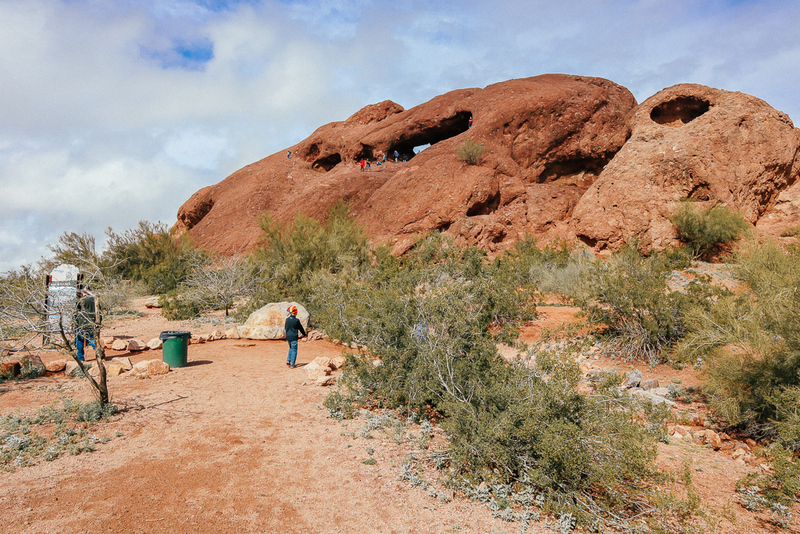 Hole in the Rock is a natural geological formation located in a municipal park shared by Tempe and Phoenix. 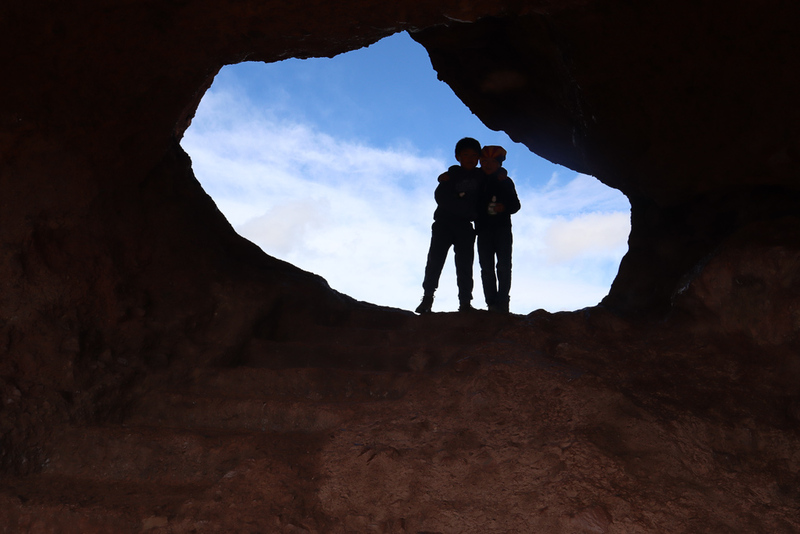 The name “hole in the rock” refers to a series of opening called tafoni that eroded in a small sandstone hill, presumably caused by water flow. Early inhabitants of the area may have used the opening in the rock to mark the seasons. Hole in the Rock is easily accessible via a short pathway behind the hill. 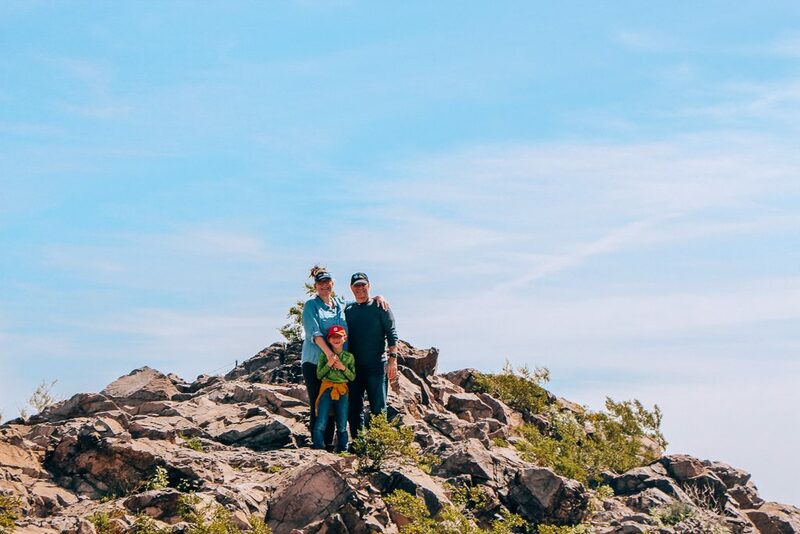 It takes about 10 minutes to get to the top, so if you're planning to watch the sunset, take that into account and make sure you know the time the sun will be setting on the day you plan to hike. I'd call this a moderate to advanced level hike, depending on how much climbing you really want to do. This was one of our favorite things we did in Tempe and I’m so glad we got to go. We had some uncommon weather – windy and rainy – when we were there and I was afraid it was going to prevent us from going up. I would not recommend this one in the rain or slick conditions. If you're interested in the history of firefighting, this is a can't miss. The Hall of Flame includes more than 90 pieces of firefighting equipment and trucks dating from 1725 to 1960. Even if you're not interested in the history of firefighting (not super high on my list of exciting things) and you have kids, considering going. There's something about kids and firetrucks – especially boys and firetrucks – and there is quite a bit of hands-on activities, such as a station where your kids can dress up like firefighters and sit in a real firetruck. There's also an area in the back that is mocked up like a firehouse, complete with a pole. My kids would have been happy to play here for hours, although it was geared toward younger kids. The Hall of Flame is open Monday through Saturday from 9:00 a.m. to 5:00 p.m. and on Sunday from 12:00 p.m. to 4:00 p.m. For more information, check out their website. 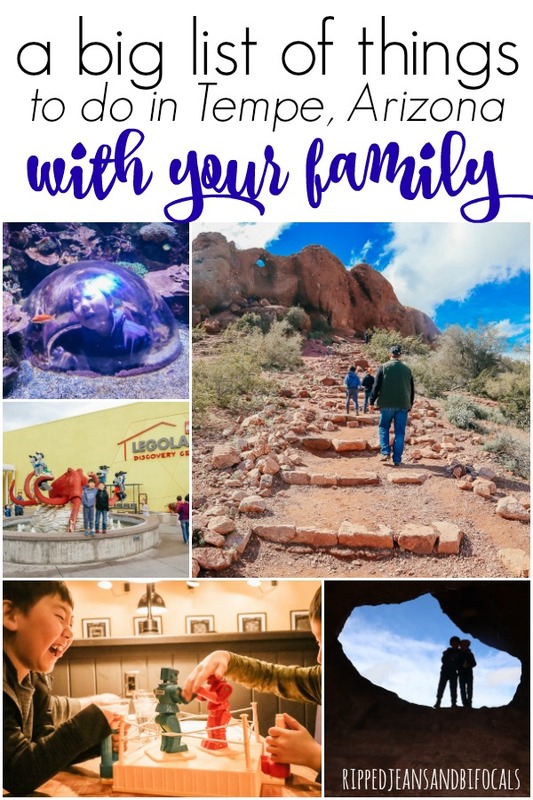 I was really surprised to an activity dedicated to sea life in landlocked Arizona, but we did and my kids had a blast here. This is a mostly indoor attraction, with some water play available outdoors. SEA LIFE Arizona Aquarium also offers special events, such as animal encounters and mermaid viewing. Check online before you visit or ask a staff member what’s available that day. Our favorite part was walking through the 360-degree ocean tunnel. 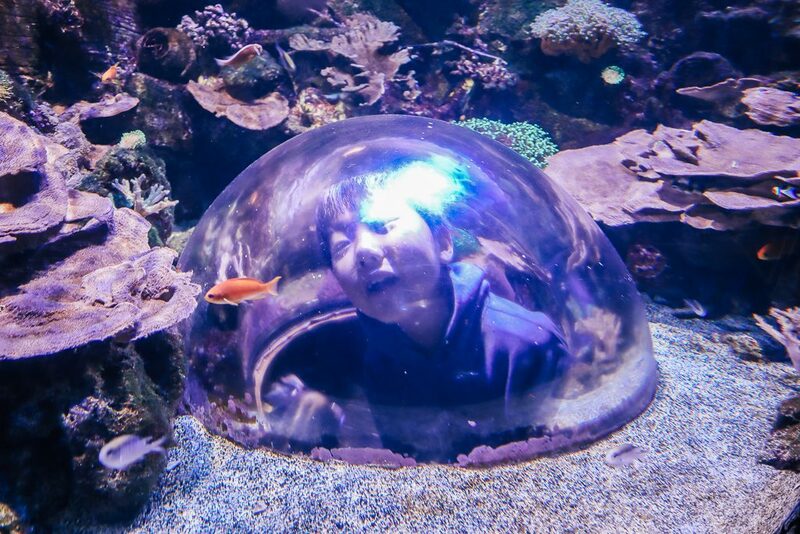 SEA LIFE does an awesome job at giving our kids a unique view of the ocean. This is an incredible view of the ocean. If you can't snorkel, this is the next best thing and this space is kid sized. SEA LIFE Arizona Aquarium is located at 5000 S. Arizona Mills Cir, Tempe AZ 85282. Hours are Mondaythrough Saturday 10:00 a.m. to 6:00 p.m. and Sunday form 11:00 a.m. to 5 p.m. You can get more info on their website. Admission is 24.95 for adults and 19.95 for kids, although you can save money if you buy online. If you buy a ticket to LEGOLAND Discovery Center (see below) you can get a pass for $5. I don’t think the experience is worth the money as a stand-alone experience but as an add-on for LEGOLAND, it’s a great value. 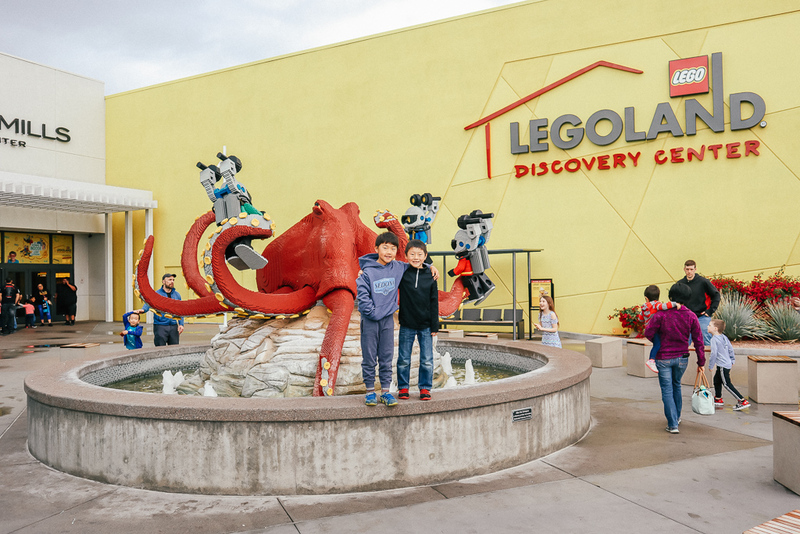 LEGOLAND Discovery Center is co-located with the Sea Life Discovery Center in the Arizona Mills shopping center…see above for directions. This is a small on space, big on fun attraction. We stayed for about three hours and honestly my kids could have stayed all day if we’d let them. We are ready to get our LEGO on! There are two rides inside, a 4D theater, and multiple stations where you can build and create. There are also classes with a master builder you can sign up for and a food court with seating for the parents. I liked that the seating was central…unless your kids are really small, you can park yourself and let your kids run from activity to activity and have pretty much a 360 view of what they’re doing. You do have to keep an eye on them, though, because the exit isn’t controlled. The food court had decent food and hot coffee and we loved that our kids could pick and choose what they wanted to do and move from activity to activity. Admission is $29.95 (walk up price) but buy your tickets online to save money. As I mentioned before, you can buy a combo pass for both LEGOLAND and SEA LIFE Arizona Aquarium at a savings. The only negative I have about LEGOLAND and SEA LIFE is that the entries are disorganized. We had passes in hand in advance of our visit and we had to stand in line with everyone else who was buying tickets. If there had been a line for people who already had their tickets like there is at most theme parks, it would have been great. We found the line process at LEGOLAND to be very confusing. There was one line for admissions and one line to buy tickets and a third line that we weren’t able to figure out…we asked two different employees and got two different answers. But, the kids’ enjoyment of both places outweighed the chaotic entry process…just bring an extra dose of patience. For more info, visit their website. If you are a baseball fan, Tempe is a great place to be. Even though our Detroit Tigers play in Lakeland, Florida, it was still really exciting for us to see a spring training baseball game. 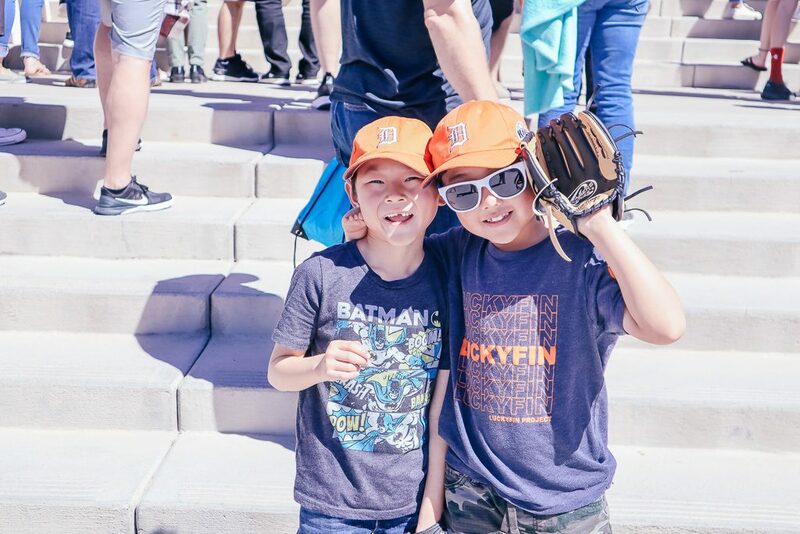 We showed up to cheer for the Angels when they played the Mariners and had a great time. And let me tell you…spring training is NO JOKE. We were anticipating rolling in about ten minutes before first pitch and enjoying some great baseball without the major league crowds. WRONG. The people in Tempe love their baseball and love their Angels. There is ample parking in the general area of Diablo Stadium, but unless you get there an hour (or more) early, you’ll be walking a long way to get to the entrance because the stadium parking will be full. 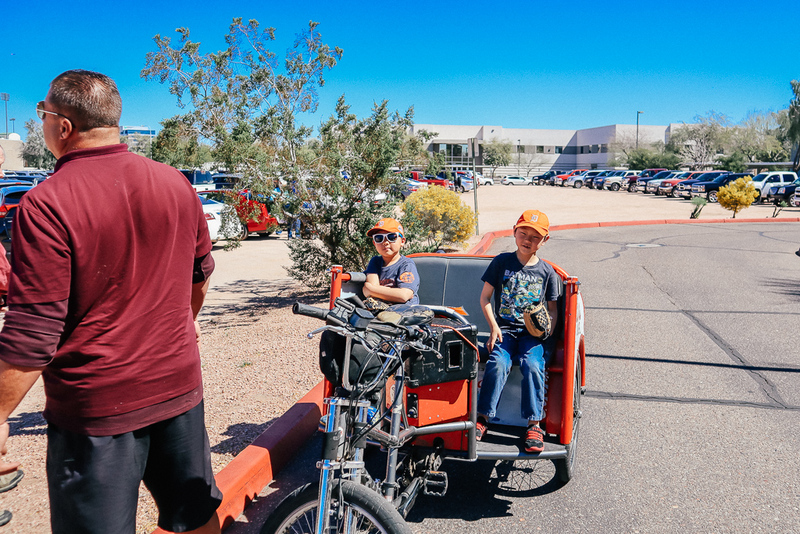 We decided to treat ourselves to a ride in one of these pedicabs to get us to the front a little bit faster and my kids thought it was super fun. For more info check out Tempe Baseball. The people of Tempe love their baseball. Come early if you want to see the first pitch. Parking is at a premium and there will be lines. The Aloha Fest was in full swing when we arrived in Tempe, so it was really fun to check out that. There’s also a boat rental kiosk here where you can rent an electric pontoon boat, a kayak or a paddle boat. They also offer bike rentals by the hour. More info here. We were scheduled to take one of the pontoon boats out and we weren’t able to do it due to high winds. 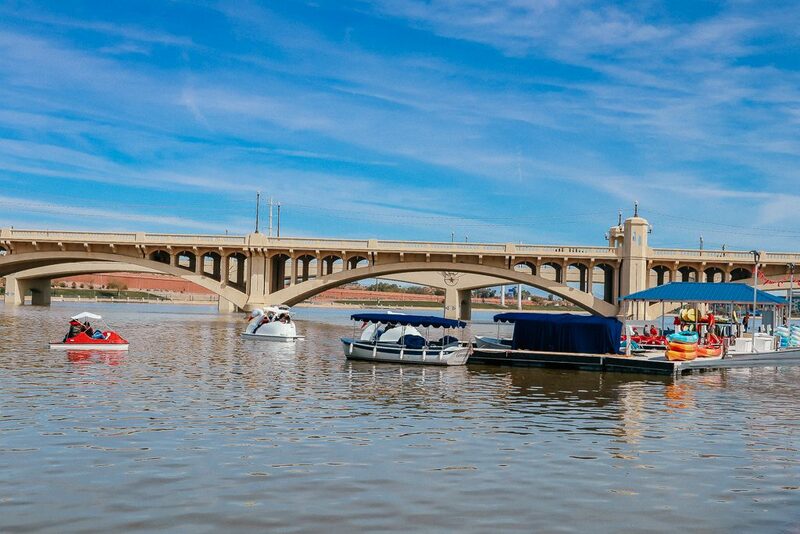 We definitely had some very un-Tempe like weather when we were there but we look forward to going out on the boats on our next visit. We didn't see anyone take the electric pontoon boats or the kayaks out but the paddle boats appear to be popular. 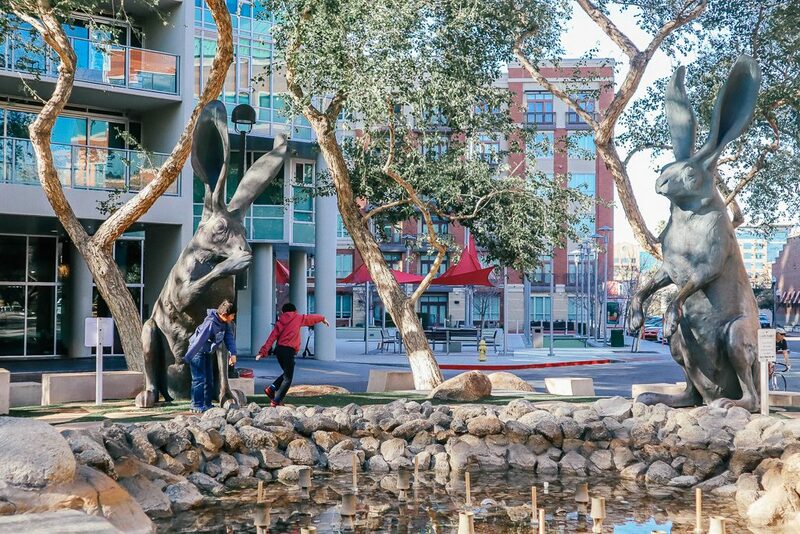 For more information on what’s happening in Tempe Beach Park during YOUR visit or to check out other events in town, check out the link at the bottom of the page. 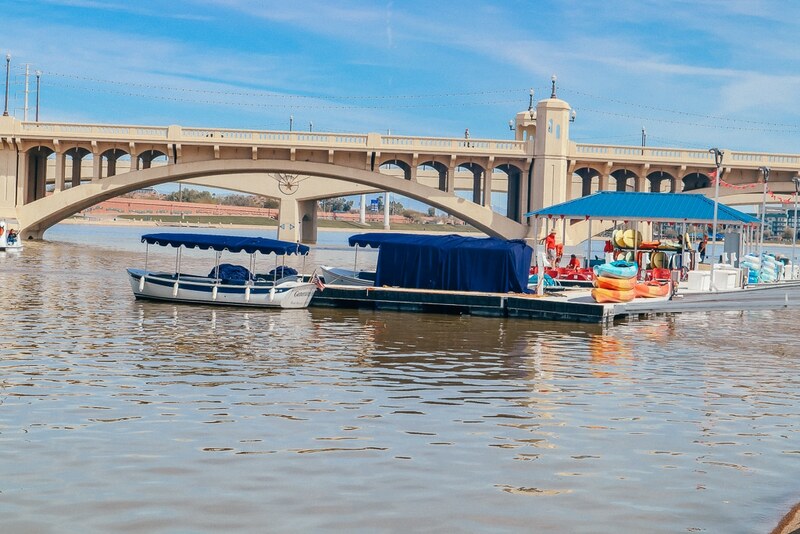 Tempe Beach Park is located at Mill Avenue and Rio Salado Parkway. There are a lot of fun restaurants, shops, bars you can walk to in the downtown area. There’s also an AMC Movie Theater that is pretty much the BEST. THEATER. EVER. 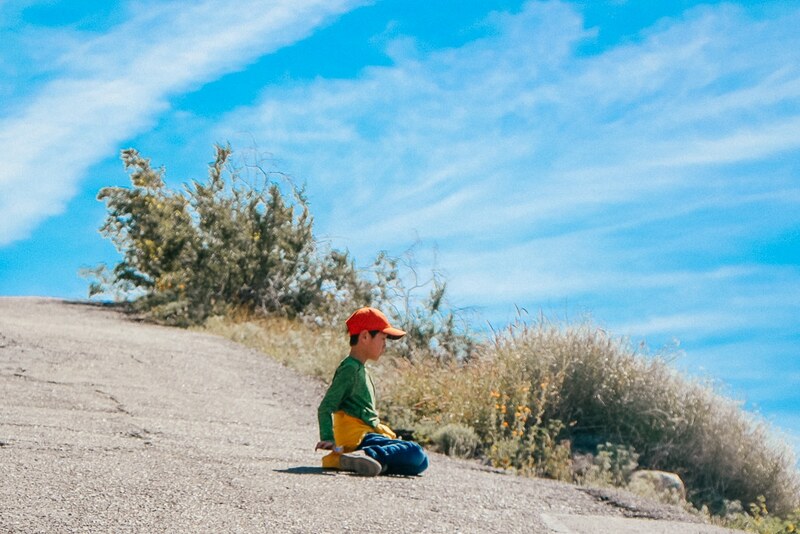 We were supposed to hike South Mountain Park and Preserve our last day in Tempe and the winds were so strong that my kids were having a hard time walking down the street…so we saw Captain Marvel in comfort. 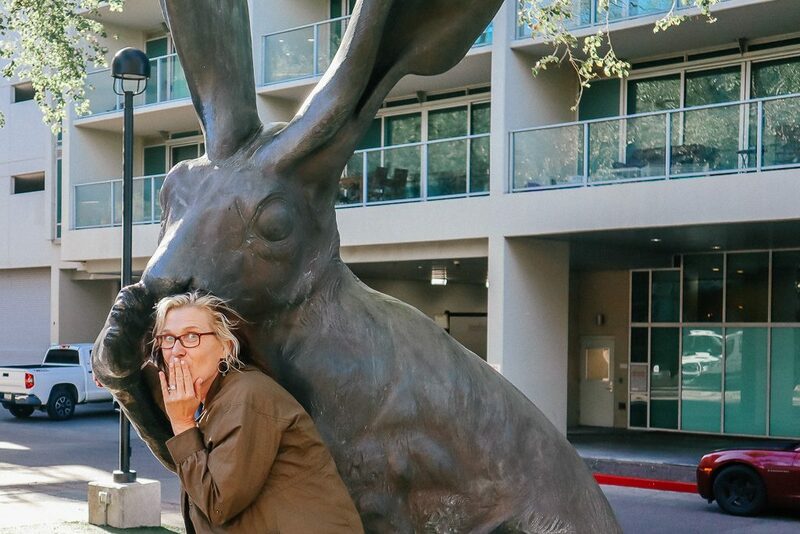 These giant hare statues in downtown Tempe are so much fun. Be prepared to pay for parking in downtown Tempe. There are meters everywhere that are very easy to use but there’s very little – if any – free parking around. Main Event Entertainment operates high volume family entertainment centers throughout Texas and Arizona. We have one in San Antonio but it's clear across town and my boys consider it a big deal to go. 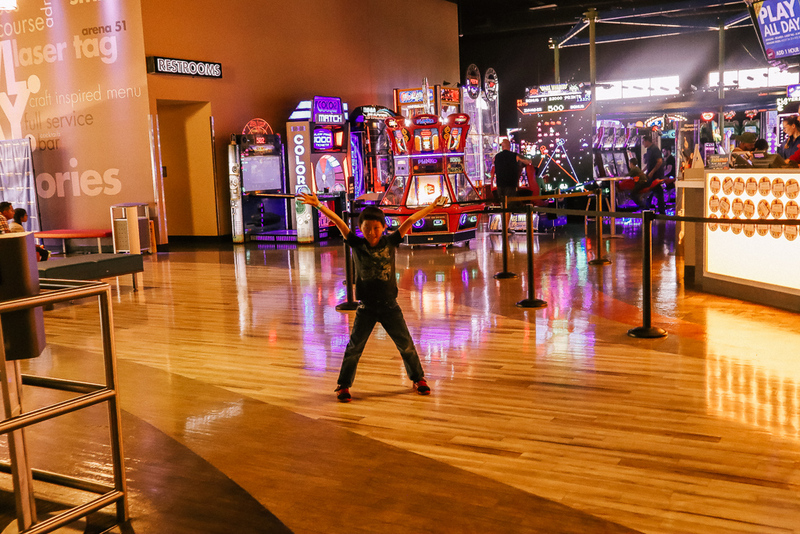 This 58,000 square foot center is home to 26 high quality recreational bowling lanes, laser tag, a gravity high ropes course, billiards and shuffleboard tables, more than 125 interactive games and a tempting array of food and beverage. We came to the Main Event in Tempe on Kyle's birthday. He said it was his best birthday ever. My husband and I were able to sit and relax over a beer (our friends from Surprise joined us for a little bit) while the boys indulged in allllll the video games and got their fill of laser tag (although let's be real, they're probably never going to agree that there is enough laser tag in their lives.) The food is very good – it's definitely not arcade or snack bar food. It's a great place for the kids to go crazy but there's also lots for adults to do, too. We saw a lot of younger adults without kids and one couple who was on a date. To learn more about the Main Event, visit their website. The Gallery of Scientific Exploration is outfitted with kiosk-style interactive exhibits and large-format, high-definition monitors that display video from Earth-observing satellites and robotic probes of other worlds. This first-floor gallery invites visitors to explore earth and space sciences through digital media, public lectures, visible laboratories, and interactive displays. The university’s meteorite collection is on level 2. If you're looking for another great indoor activity in Tempe, this could be it. For more info, visit their website. You can’t come to Tempe and not check this place out – you just can’t. 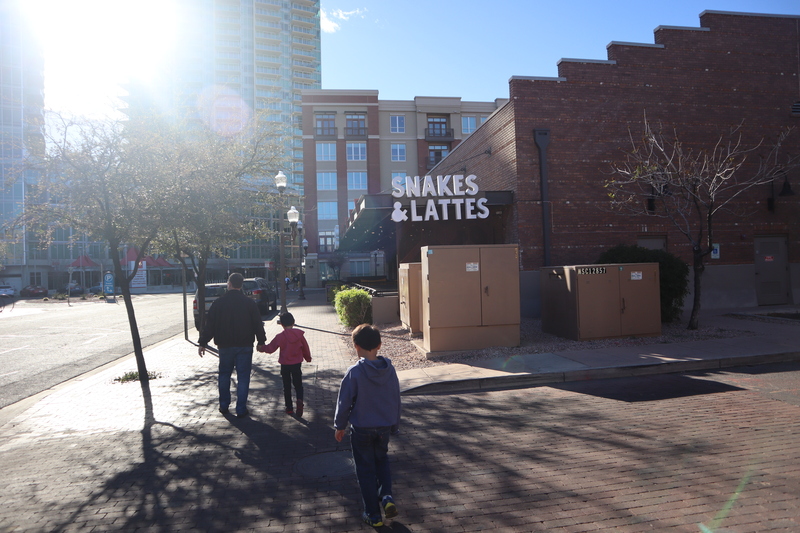 Snakes and Lattes is a place like absolutely no other. First, they have a great and inventive food and bar menu. 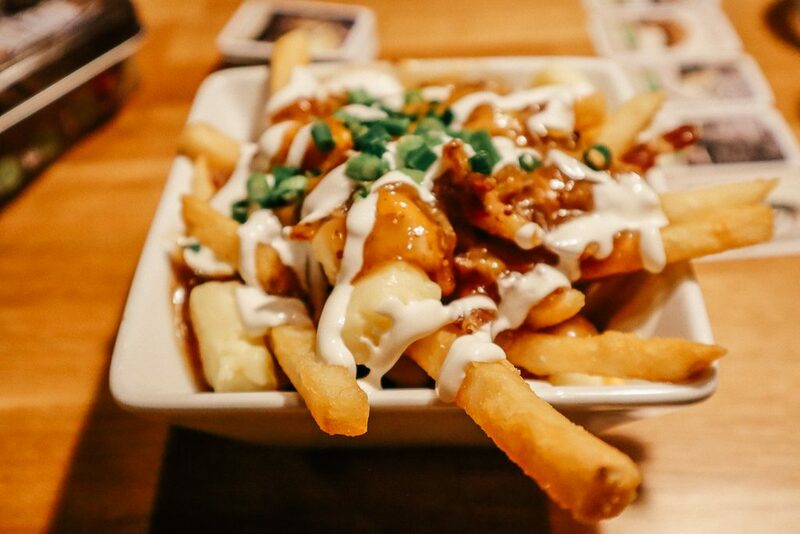 I recommend the poutine…it’s hard to find in Texas and I was excited when I saw it on the menu. And, as their name suggests, there’s also an extensive coffee menu. 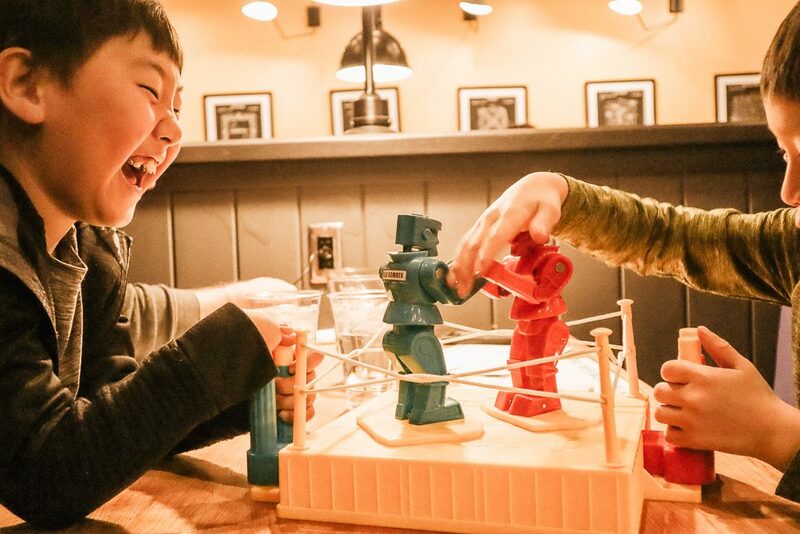 This was the first time my kids played Rock ‘Em Sock ‘Em Robots. It was clearly a hit. Also, why isn't there more poutine in Texas? I tried it in Rochester New York, which is close to the Canadian border. If it's in Arizona, why don't we have it? As great as the food and service is, what really makes Snakes and Lattes pop is the selection of board games. There are hundreds of board games, puzzles, card games, dice available for you to play at the flat fee of $5 per person and you can switch games as often as you’d like. They are sure to have your favorite there but what’s fun about Snakes and Lattes is that they will have games you’ve probably never heard of and they have a dedicated games person that can make suggestions or help you if you get stuck on something. We told our games guy that we wanted something our kids could play by themselves and that we (my husband and I) liked trivia games. We had never heard of the games he suggested but they were a hit. Snakes and Lattes is a great place to go for great food and drinks but it’s also a great place to go and unplug. On our way out, we saw a group of people in their early twenties playing the kids game of Headbanz…and having an absolute blast doing it. It made me smile. It’s just that kind of place. Rustler’s Rooste has a lot going on. There’s a bull outside you can visit, there’s multi-level seating, gorgeous views, live entertainment and a slide that goes from the check-in floor to the main seating area. Yep, your kids can go down the slide on the way to their table. Adults can, too…ask me how I know. You’re never too old for a slide, right? At least I'm not. The birthday package at Rustler's Rooste includes a “piece” of cake, plus a hate and a bandanna. 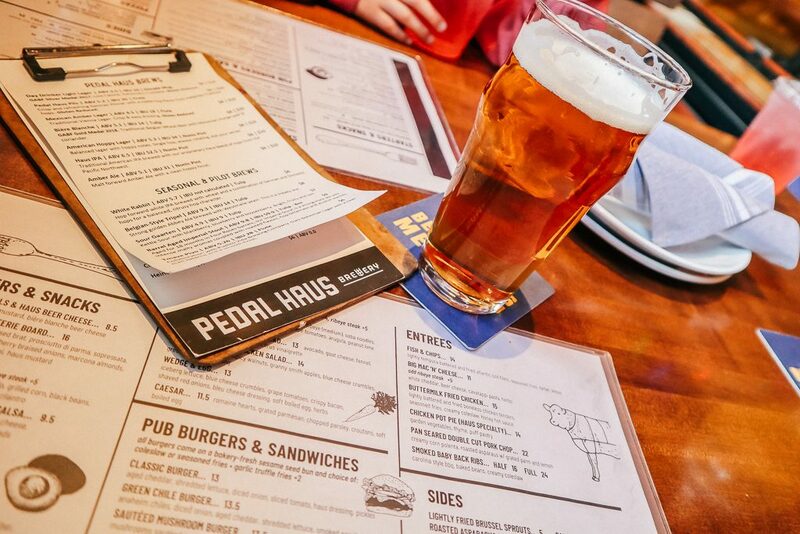 The food and service are great – definitely come hungry. My husband and I tried “Cowboy Stuff” which is a sampler platter available for two to four people that has a little bit of everything: salad, steak fries, beans, ribs, chicken and more. 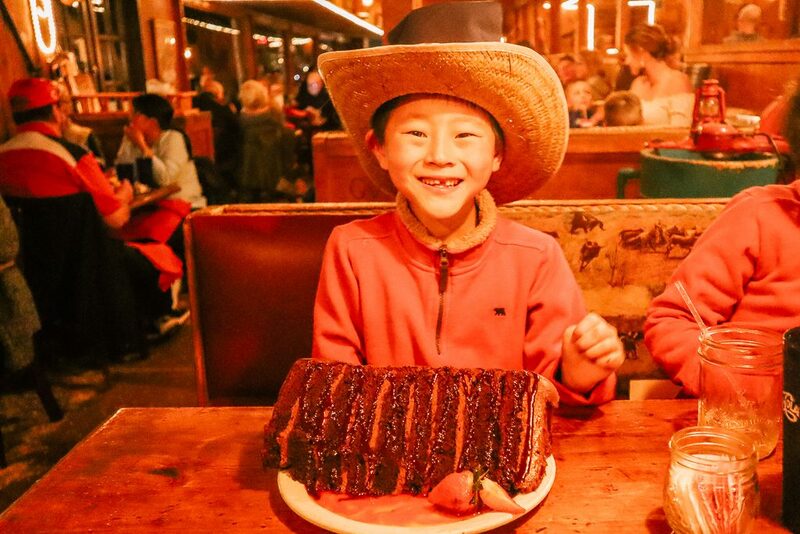 We celebrated our son’s birthday at Rustler’s Rooste – they do a birthday package that you can add on for $17 that includes a picture, a hat and bandana, and a piece of chocolate cake. And when they say piece of cake, they mean a giant piece of cake. There was more cake on that plate than the four of us could eat. The Daily Jam is a breakfast, brunch and lunch place in downtown Tempe. Although their claim to fame is Arizona’s best waffles, none of us had the waffles. 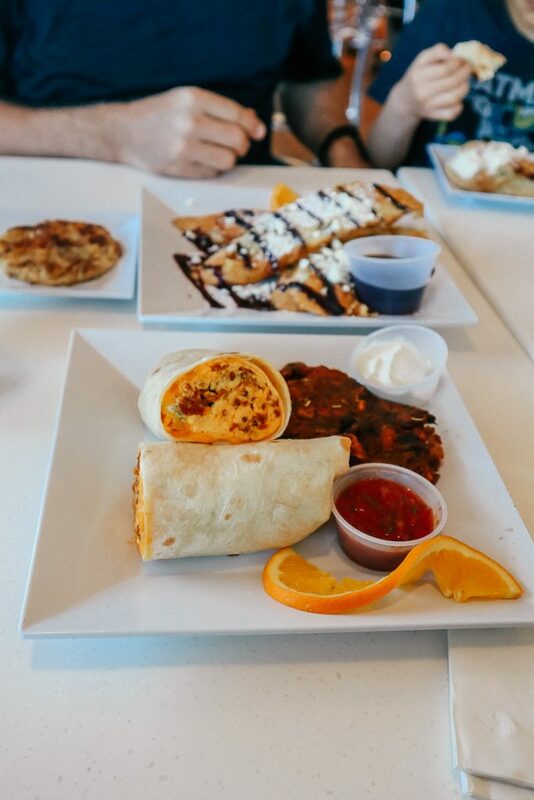 We can recommend the jalapeno popper avocado toast, eggs benedict and the Denver saute…all of these were lick the plate delicious. The Daily Jam has walk up ordering and your food and drinks are brought to your table. They also serve alcohol. We recommend the spicy basil Bloody Mary and the mimosa. We kept saying we were going to squeeze in a return visit to try those waffles and we never did. TRES Tempe is a high volume, trendy dining concept offering a fresh and vibrant casual dining experience. TRES Tempe offers a modern interpretation of the Mediterranean and the Southwest, blending flavors and traditions in a space that expresses the freshness, simplicity and sincerity found in the cuisine of the region. More info here. 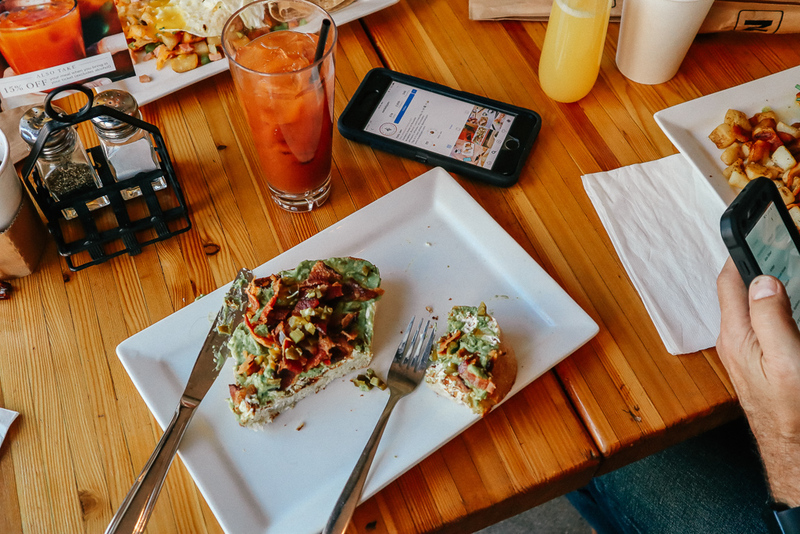 Scramble is a self-proclaimed “breakfast and brunch joint.” Like The Daily Jam, it has walk-up ordering with food and drinks brought to your table. They're open every day from 6:00 a.m. to 2:00 p.m. More info here. Southwest Burrito & Blueberry Stuffed French Toast. Hubby had the Scramble Browns (loaded with bacon and cheese) and I had the sweet potato hash. When we went, there was a 15-minute wait just to get in the door, but the food was worth the wait in line. Once we were in the door, the line moved pretty quickly…I estimate we probably waited about 20 minutes total to order and about another 15-minutes for our food. If you want a great breakfast or brunch, don't let the line deter you. This one is worth the wait. This is one we didn’t get to try – the wait on the day we chose to go was 45 minutes and we weren’t willing to wait that long. It’s a popular place near the university so keep the wait time in line if you plan to visit. More info here. This was our “second runner up” after the long wait at Snooze and I’m really glad we came here…although I was bummed not to have checked out Snooze. This place has a really inventive and light menu. 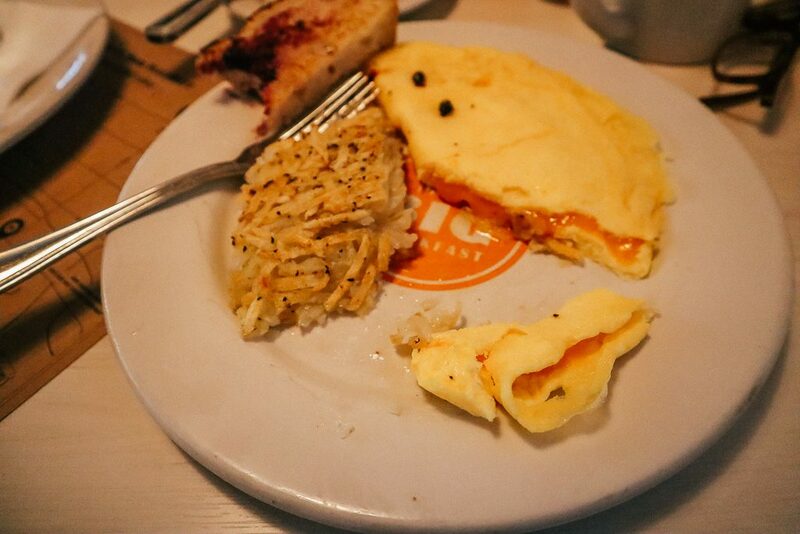 I recommend the cheese omelet – I know that sounds boring but it was done to perfection with hash browns and sourdough toast – and the mimosa flight. The mimosa flight was delicious but it’s very boozy – my husband helped me out on these, otherwise I’d have needed a post-breakfast nap. The menu is simple and hearty. They're open every day from 6:30 -2:30. More info on their website. We made a really quick stop here after we got finished hiking A Mountain. We absolutely can't resist an Irish pub, which reminds me, we need to plan another trip to Ireland. We didn't eat but they do serve food. Check out their websitewebsite for more info. We stopped here for a beer before catching a movie downtown. Their menu looks amazing and I'm really sorry we didn't eat here. More info on their website. This is a very short-list of places to eat that represents what we experienced first hand or researched. 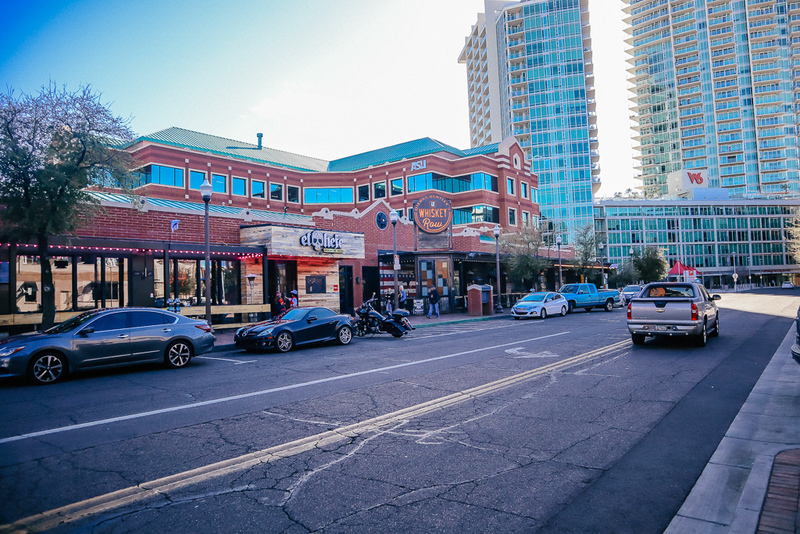 There are a ton of great places all around Tempe, so although this list of eats can definitely get you started, there are so many fun places to check out. If you’re planning to visit the Phoenix area, don’t miss Tempe, but this is honestly a stand-alone destination. 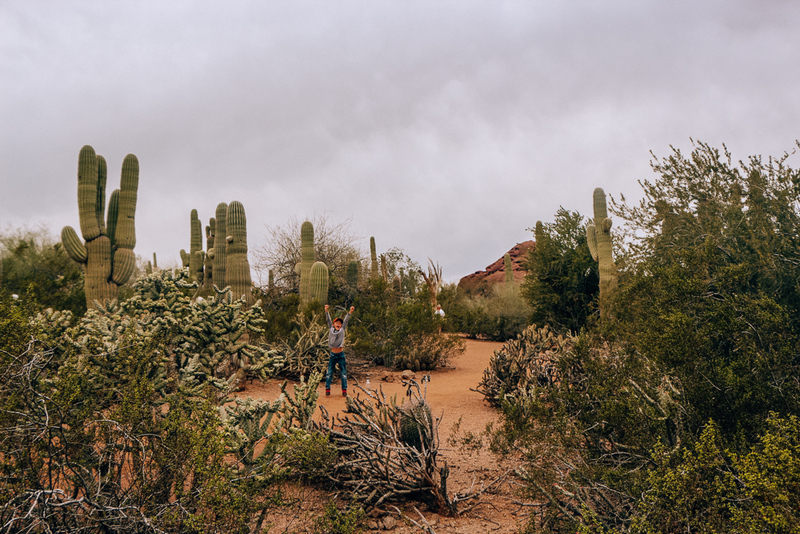 With the exception of the Desert Botanical Garden, which might as well be in Tempe, we had four very action packed days without venturing into Phoenix.